Action from Yaxley's FA Cup tie against East Thurrock. Photo: David Lowndes. Peterborough Sports bowed out of the FA Cup with heads held high at Hitchin last night (September 14). The city side twice led a team that play their football three divisions higher, but they conceded two goals to 10 men in extra time as Hitchin ran out 4-2 winners. Jordan MacLeod opened the scoring for Sports in the first qualifying round replay on 15 minutes with a brilliant strike into the top corner from 30 yards, but the hosts were level nine munites later. Avelino Vieira bundled home a Jack Bloodworth cross following a goal-keeping error to restore Sports’ lead, but again Hitchin equalised before the break. Hitchin lost a player to a red card towards the end of 90 minutes, but they still finished the stronger in extra-time, scoring twice in the extra period. Sports, who were playing in the FA Cup for the first time in 93 years, failed to make the best use of an extra man, but they were only denied the lead at the start of added time by a cracking double save that thwarted Karl Gibbs and Vieira. Tonight (September 15) it’s the turn of Yaxley, Deeping Rangers, Stamford AFC and Holbeach United to try and reach the second qualifying round. 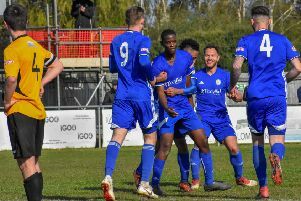 Spalding United are the only local side already through and they have been handed a tough game away to Northern Premier Division side Coalville. The Tulips play in the division below their opponents. Holbeach United would have a plum tie against Vanarama National North Division side Worcester City at Carters Park if they win their replay at Stourport. There’s also an attractive tie awaiting Deeping Rangers if they can take out Leek Town as a home game against AFC Rushden & Diamonds awaits. Yaxley re-stage their first qualifying round game against East Thurrock. The original tie was abandoned with five minutes to go because of an injury to a visiting player with the score standing at 0-0. The winners of that tie will travel to Carshalton Athletic of the Ryman South First Division. If Stamford beat Leamington they will travel to either Coleshill Town or Newcastle Town. The second qualifying round ties will take place on Saturday, September 26. Draw: Coalville v Spalding United, Deeping Rangers or Leek Town v AFC Rushden & Diamonds, Stourport Swifts or Holbeach United v Worcester City, Carshalton Athletic v Yaxley or East Thurrock United, Coleshill Town or Newcastle Town v Leamington or Stamford,. Peterborough Northern Star and Bourne Town are in United Counties League Cup and Hinchingbrooke Cup action tonight. Star have signed striker Declan Rodgers from Wisbech and Tom Waumsley on a dual registration from Spalding United.